No one is standing on ceremony in Impro Theatre’s latest comedic invention, Shakespeare UnScripted. On the contrary, the only formality you’ll find here is the kind you leave at the door when you step foot into the theater. 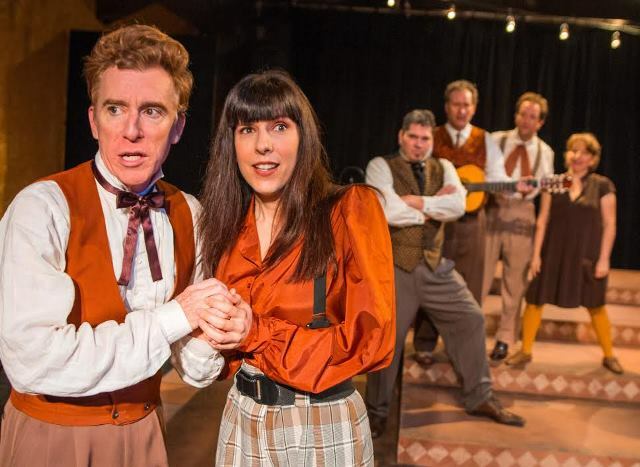 Impro’s boisterous crew offers more belly laughs than anyone making up a Shakespearean situational comedy should legally have the right to, and it doesn’t matter whether you’re a Shakespeare smarty-pants or a total newbie to have a great time. The framework is inspired by the play-within-a-play structure of The Taming of the Shrew, with the actors welcoming audience members into their Italian café; soon to be the stage upon which they will perform. By the way, the transformation of the newly-redesigned Carrie Hamilton from proscenium to black box is rather dramatic and if you remember its antiquated state, you’ll be pleasantly surprised at the update. Using only two suggestions from the audience – in this case, something from nature (a sirocco) and an event (a coronation) – 7 of Impro’s 17 company members begin to create a brand new play full of the conceits and story threads normally found in Shakespeare’s comedies. There is love, intrigue, mistaken identities, a resolution of the plot twists in the final minutes, and even some hilarious singing and dancing. It will change at every performance based on what the audience volunteers and where the characters’ fancies take them, but to a one, every actor jumps into this quirky Shakespearean world with ease. On opening night, Paul Rogan appeared as a newly-minted king convinced to find a wife by his servants, Dan O’Connor (the honorable one) and Brian Lohmann (the questionable one) while a sweet servant (Lisa Fredrickson) and two plotting princesses (Kelly Holden-Bashar and Edi Patterson) journey to his city, accompanied by a fool (Stephen Kearin). Much of the fun is in watching how they establish the characters and then work to integrate them into the story. A running gag started early on when two of the actors misjudged the other’s timing and began to speak at the same time, causing more than a few jokes about the plague of interruptions rampant in Verona. It also prompted a very funny rebuke later in the show when an upstage actor attempted to step into a pause in the downstage conversation. But it’s never a problem. Instead of ignoring the fumbles, the cast works them into the story, taking advantage of every opportunity to laugh at themselves too. And that makes the audience feel even more included. After all, who doesn’t like feeling like an insider. From beginning to end, this is a complete team effort, and that also means Michael Becker improvising the lighting and Alex Caan improvising the sound; not an easy task. Becker has an intuitive ability to predict when a scene has run its course and Caan pulled out a couple of musical transitions that were exceptional. Sandra Burns’ Mediterranean color scheme visually unites costumes and set by using rich Tuscan gold and sienna accents. Good improv is hard to beat and in L.A. you can find plenty of it. Great improv, like the kind Impro Theatre creates, takes comedy and turns it into an art. I swear, we couldn’t stop laughing.